Dr. Derek Sloan and Dr. Wilber Sabiiti recently represented the University of St. Andrews at the 8th EDCTP forum 2016. 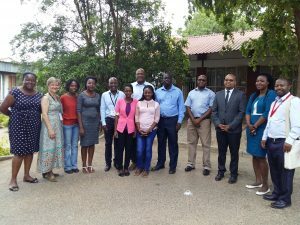 The conference was organised by the European & Developing Countries Clinical Trial Partnership (EDCTP) and hosted by the Zambia’s Ministry of Health. The conference was multidisciplinary attracting in equal proportions scientists, social anthropologists, civil society activists and policy makers. The presentations were translational in nature emphasising the importance of translating research into policy and practice. Derek talked about the causes of disease relapse among tuberculosis (TB) patients and recommended ways that further research can be done to answer questions about TB persistence and relapse. Wilber presented the findings of the multi-site evaluation of the St. Andrews’ developed novel molecular bacterial load assay (MBLA). 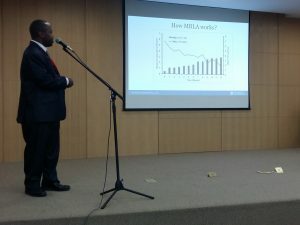 MBLA measures the TB burden of patients and shows the decline as the patients responds to therapy. The assay comes as relief from the traditional TB culture methods which take weeks or months to give results and always affected by contamination. With MBLA a result is available within 4h of the sample reaching the laboratory. Talking about MBLA was exciting as it attracted a great deal of discussion among the delegates as well as interest to apply the assay across the African continent and beyond. Wilber also joined the EDCTP secretariat team to visit the Zambia’s Malaria Control Centre who by using modern control methods have seen the transmission and parasiteamia of Malaria drop to zero in some parts of high malaria burden in Zambia.